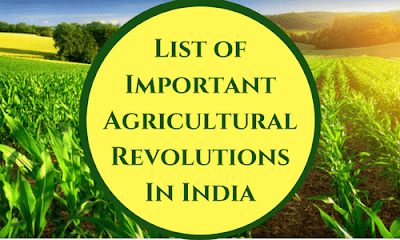 The following table briefly highlights the important agricultural revolutions of India and the table is followed by some very important key points that one must remeber for the competitive exam. The initiatives, led by Norman Borlaug, the "Father of the Green Revolution"
Durgesh Patel is known as father of pink revolution. It was launched to increase the Pharmaceutical,Onion and prawn production in India.